Today was the day! You had purposely gone through all of your assignments and finished them in advance so that you would have time to visit Mangaket - a manga market held only twice each year. Growing up outside of Tokyo, you never had the chance to attend and so you weren’t going to let anything stop you from finally experiencing the event. Though, today you would be going alone. It seemed everyone was too busy and Toshiko didn’t even reply to your message. If anyone were to join you for this event, you thought she would have been the most promising. Although, she had a habit of taking much longer to reply to a message than most people. 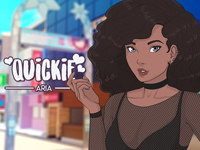 Maybe she doesn't like the idea of crowds… Grabbing your bag, you leave to the train station and head to Harajuku, in which you run into the bubbly, bushy-haired Aria. Ahh surprised you uploaded this before Victoria and Toshiko.